She has a perfect nice quality bisque head with lovely colouring. She has fixed blue paperweight eyes, pierced ears, her original cork pate and real hair wig which is a little sparse in places. 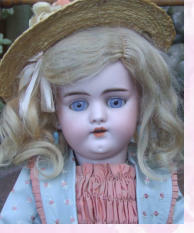 Her body is original and chunky and does not seem to have had any damage but has had a repaint which looks acceptable. Her clothes are antique and l have added an extra petticoat and socks. She measures almost 31 inches and dates around 1900.